Trevor Pateman's Philately Blog: Don't Do It, Dr Seichter! You wouldn't do it to the Mona Lisa, so don't do it to your postal history collection! 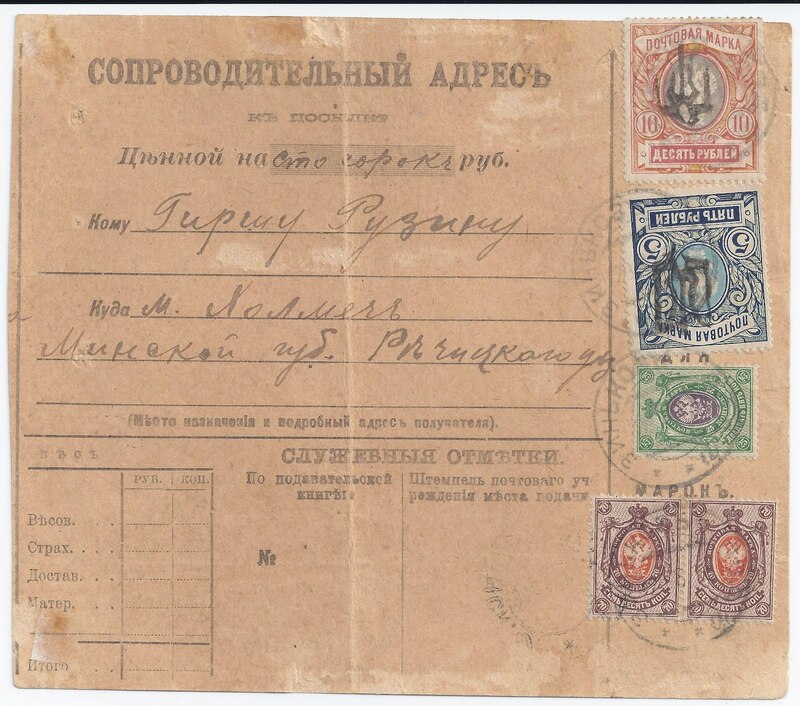 After showing you this Parcel Card, I will be trying to restore it to its original condition. 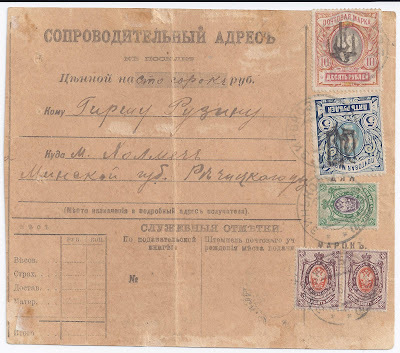 There are three more stamps on the back bringing the franking up to 17 r 25 kopeck, which corresponds to the faded tally bottom left. It is very interesting and probably excited Dr Seichter - he stuck on more labels than usual. First, it shows use of Trident overprints at a very early date (ZINKOV POD 29 8 18). Second, the destination in Minsk Guberniya is unusual (it arrived there KHOLMETCH MINSK 7 9 18). 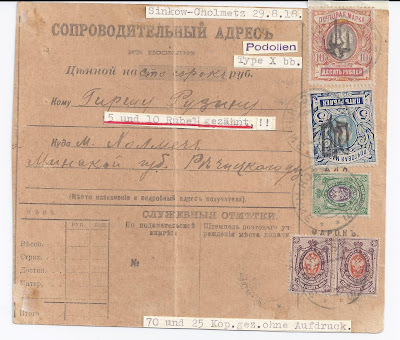 Third, it shows mixed usage of overprinted and unoverprinted stamps (permitted at this date). Fourth, the 5r and 10r stamps with Podillia 10bb are rare (Bulat 1770 and 1771, $200 and $225). One can also speculate: high value stamps were in short supply, especially perforated and these got used up first. You are more likely to see a 5r or 10 r perforated used in August-September 1918 than six months later.